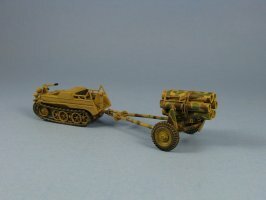 Inside the box you get two Nebelwerfer 41 launchers. Parts are molded in a light tan coloured plastic that neither too soft nor too hard, or “just right” as Goldilocks would say! There is an instruction sheet and no decals are included. 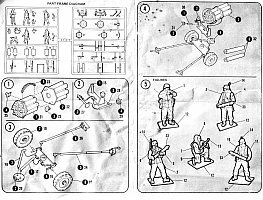 The parts are spread over two identical sprues: 24 parts to make 6 figures (bodies and bases) plus their personal weapons (4xK98 Rifles, 1xMP38 SMG) and 25 pieces for the Nebelwerfer (19), ammunition cases (2) and rockets(4). Flash is minimal but most parts do have seam lines that need to be removed. There are a few ejector pin marks to watch for, with some found in bad places. 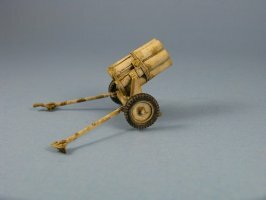 Two especially egregious ones are found on the front face of the wheels and another large one in the middle of the back of one of the figures. The tires have no tread. 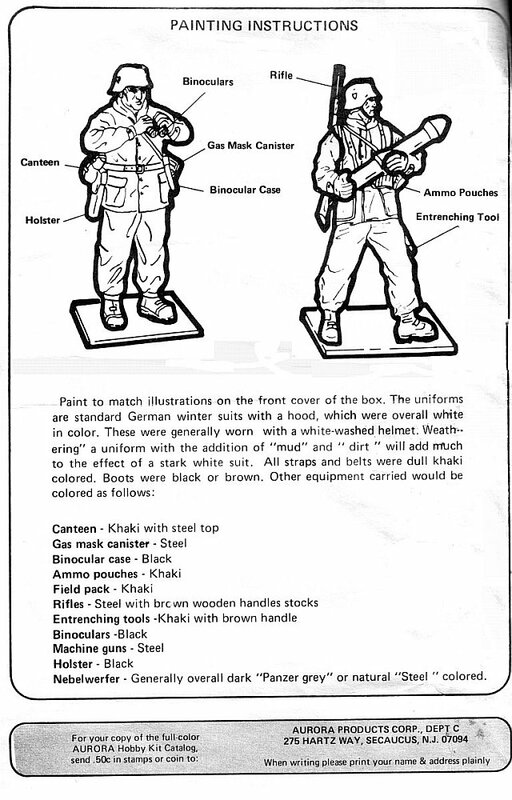 Detail of the figures is not bad but I feel that there could be a bit more relief, especially in the clothing, which appear a bit flat to me. The personal weapons are quite nice. 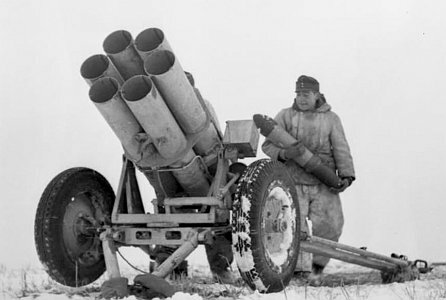 With two launchers to work with I chose to build one in firing position and the other as a towed piece. And knowing that some work was definitely needed to make the lunchers more realistic, I also decided to try two different construction approaches. 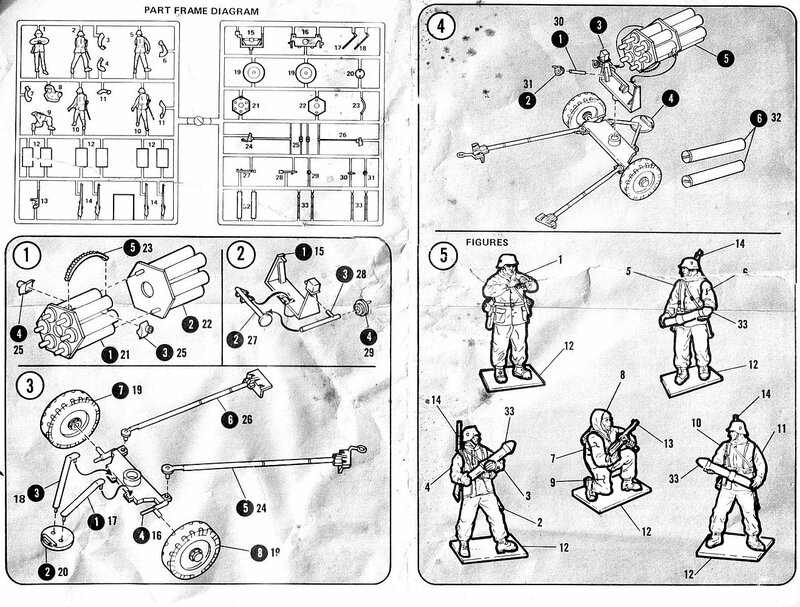 I followed the build sequence as outlined in the instructions for the most part, so I'll review this kit on a step by step basis and point out where I deviated from the instructions for each launcher. Before doing any gluing the much too narrow tubes holes need to be drilled out. This I did in stages using increasingly larger drill bits to widen the holes. If you want a "see through" look to the tubes as I wanted, the molded on rockets at the end of the tubes have to be removed and then the solid bulkheads on each end of parts 21 and 22 need to have holes drilled through them. For the towed launcher I also removed the bottom end of the tube and added new sections from plastic tube. 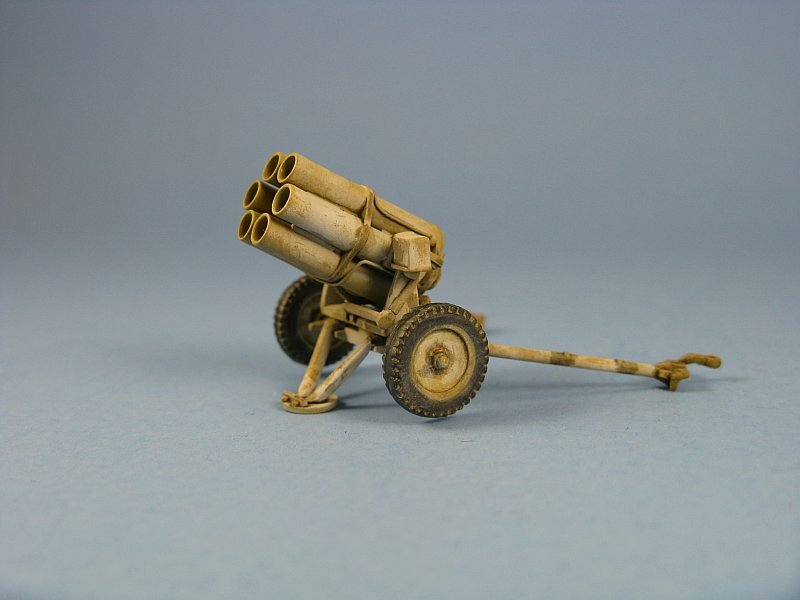 For the launcher in firing position I just opened up the end and left the molded on tube in place. The pivot brackets (2xpart 25) that mount to the tubes are a problem and I decided to put them on a later point. 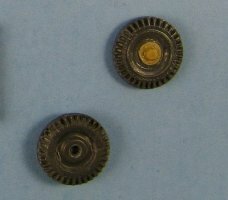 If added as per the instructions the toothed elevation gear (part 23) would not touch the elevation shaft (part 27) and there will be a big gap between them. Also the tubes will sit too high in the mount and look odd. The mount (part 15) has a prominent seam that fills most of the hole created between the brace and the upright. For both launchers, I cut off the brace, removed the seam and added a new brace from plastic strip. The elevation wheel (part 29) was left off to be added later to lessen the chances of it being damaged during the remainder of the build. This is the step where the carriage is put together. 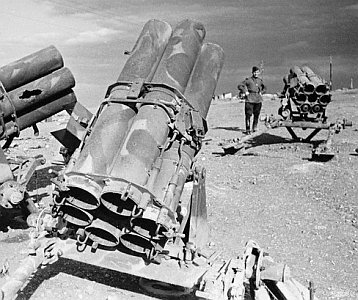 First, the spades on both launchers were thinned. For the towed piece I glued the trail legs together and modified the front support braces into their folded position for travel. The one in firing position was constructed as per the instructions with the legs splayed and the brace deployed to touch the ground. 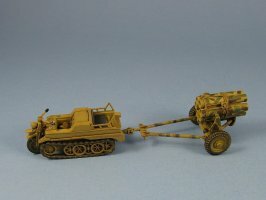 Since none of the kit wheels (2xpart 19) were not up to snuff I substituted different ones. 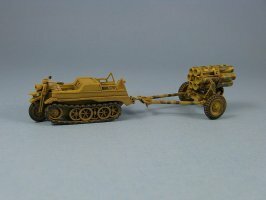 On the towed Nebelwerfer I used a set of Esci Pak35/36 wheels. The hubs on these were poor so I removed them and added the hubs which were cut from the kit's wheels. 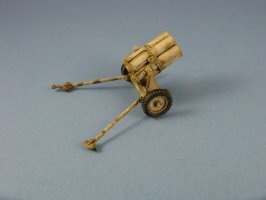 On the other I used a set of wheels liberated from a MAC Flak38. All the wheels were also left off until later so they can be painted separately. Here the majority of fiddly work occurred. First I had to figure out exactly where the pivot brackets, which I had left off until now, needed to be mounted on the tubes. They fit as designed when mounted per the instruction sheet, but if you try to mount them higher on the tubes so as to bridge the gap between the elevation gear and the elevation shaft, they spread the uprights close to the breaking point due to their thickness. So, to get a proper fit between the tubes and the uprights some thinning was in order. Again, I tried two different approaches. For the towed piece I cut off the backing plates to the pivot brackets, thinned the pivots with some sanding and added them to the tubes (picture to the left). This method allowed me to retain the mounting pins on the upright. 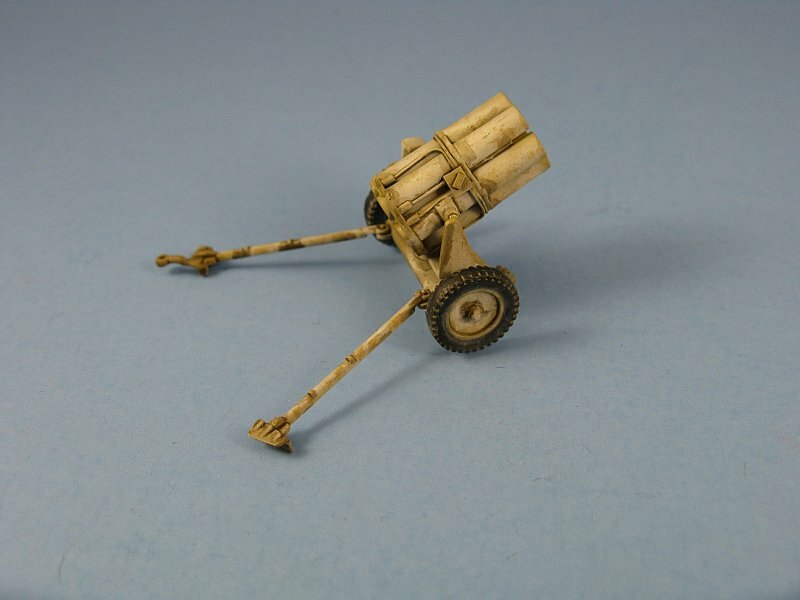 For the Nebelwerfer in firing position I thinned the backing plates on the pivots brackets and then glued them to the tubes (see picture below). This method forced me to trim the mounting pins to have the tubes fit between the uprights. For both methods, a lot of trial and error was needed to get everything to fit properly. In the end, both methods worked quite well though I have to admit that the second method looks slightly better than the first. Next came the detailing of the tubes. The base kit is devoid of any of the ignition wires. These were added using thin wire and thin super glue was used to fix them in place. A distributor box was added at the wire junction point from plastic sheet. The two hand wheels for traverse and elevation (parts 29 & 31) were glued onto their shafts this point. 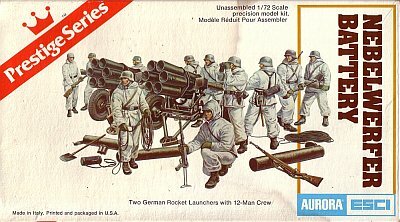 With the thought that I may at one time try to put one or both of the Nebelwerfers in a diorama, I put together two of the figures and separated the rockets from the sprues. Removing the rockets (4 x part 33 ) requires some care. Make sure to cut them from the sprues leaving some of the injection gate in place so you can sand the tip of the rocket to its proper pointed shape. 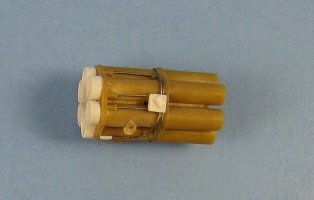 The transport tubes (2 x part 32) are not as detailed as shown on the instruction sheet and they suffer from large injection holes. I chose to replace them with scratchbuilt examples made from plastic rod with end caps punched from some plastic sheet. 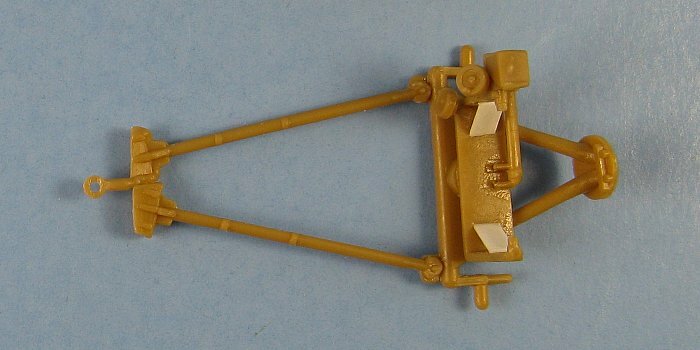 I added grab handles from spares found taken from a depth charge etched brass set. There has been some debate over the years as to the kit's scale. 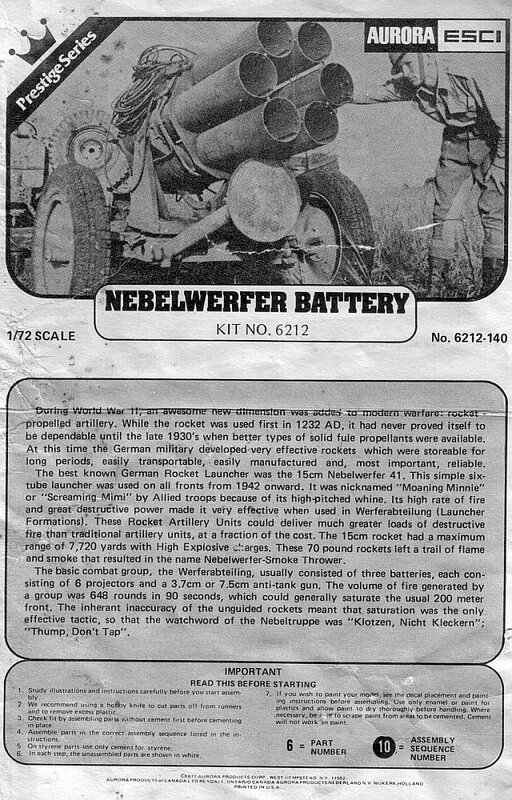 I don't have much data on the various dimensions of the Nebelwerfer 41. What I do have gives the tube length as 51 inches. In 1/72 scale that works out to .71in. My dial calipers measure the kit's length at .71in, making the Esci kit exactly 1/72 scale as far as the tube length is concerned. I'll just have to assume that the rest of the kit's dimensions are somewhere in the same ballpark. This kit is showing its age. My copy had a copyright date of 1977. Though the quality of the moldings are passable, especially when compared with some of the limited run injected offerings, the detail is not, which requires the builder to go that extra mile to make an acceptable model for display. What is really odd, is that after all these years, the Esci kit remains as the sole injected plastic Nebelwerfer available to the 1/72 scale modeller, which is why it still commands a fairly sizeable dollar value when it shows up for sale on online sites like eBay.